Just because fall clothes are hitting stores and the kids are going back to school doesn’t mean you have to bid farewell to your summer glow. After all, it’s still too hot to cover your legs and shoulders in autumn garb. But by this time of year, all of those trips to the pool and long days in the sun tend to take their toll, leaving your sun-kissed skin dry and dull. 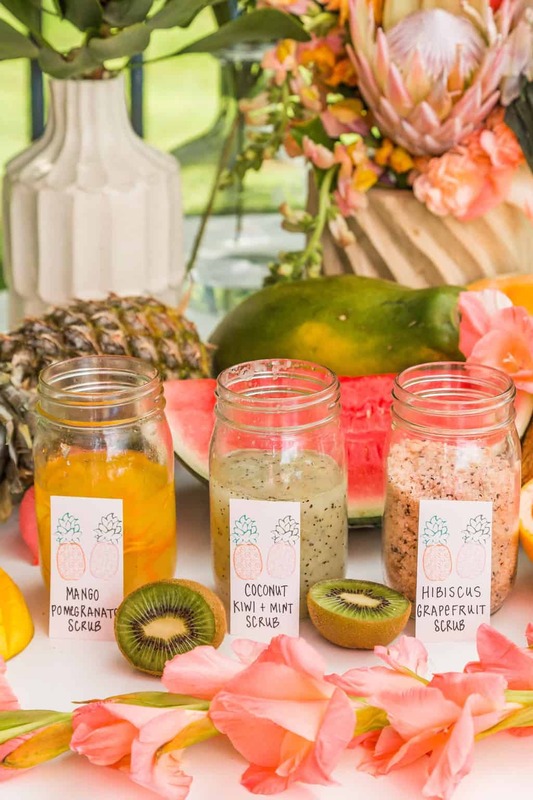 These DIY tropical body scrubs inspired by our favorite fruits are the perfect solution to dry summer skin — and to those end-of-summer blues. This cooling scrub is perfect on days when your skin is feeling irritated, itchy or overheated. The kiwi’s high vitamin E content moisturizes skin, while the peppermint essential oil is a refreshing addition to soothe irritation. 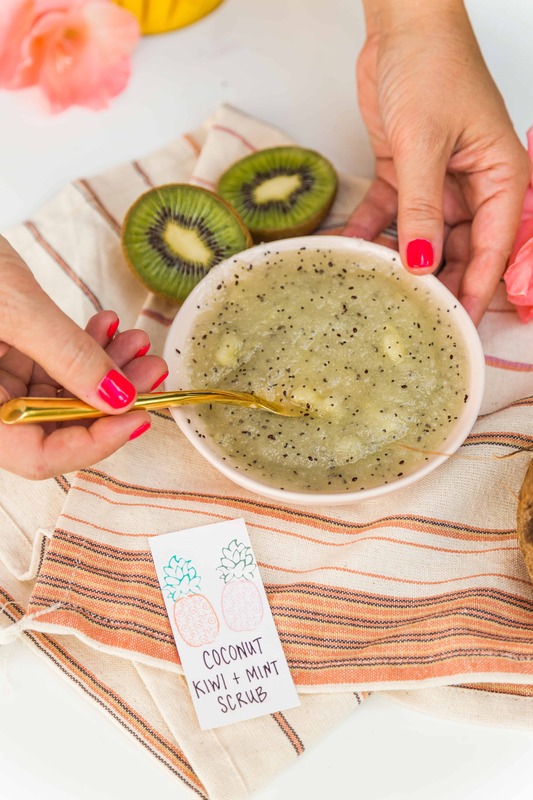 Plus, the vitamin C and antioxidants in kiwi help boost collagen production, maintain elasticity and fight signs of aging. Combine that with the blissful addition of coconut oil, which increases hydration, reduces water loss and speeds up wound healing, and you’ve discovered smooth skin nirvana. Remove the skin from the kiwi and scoop out the flesh. Use fork to crush and blend kiwi flesh until smooth. Mix in 1 cup of mineral sea salt, 1/4 cup coconut oil and 10 drop of peppermint essential oil. Blend well. Add more coconut oil, if needed, to get the desired texture. Sprinkle in a few poppy seeds for extra kiwi cuteness. Use as exfoliating scrub on skin in shower or bath and rinse with water. To soothe extra irritated skin and enhance cooling properties, leave scrub on skin for a few minutes before rinsing. 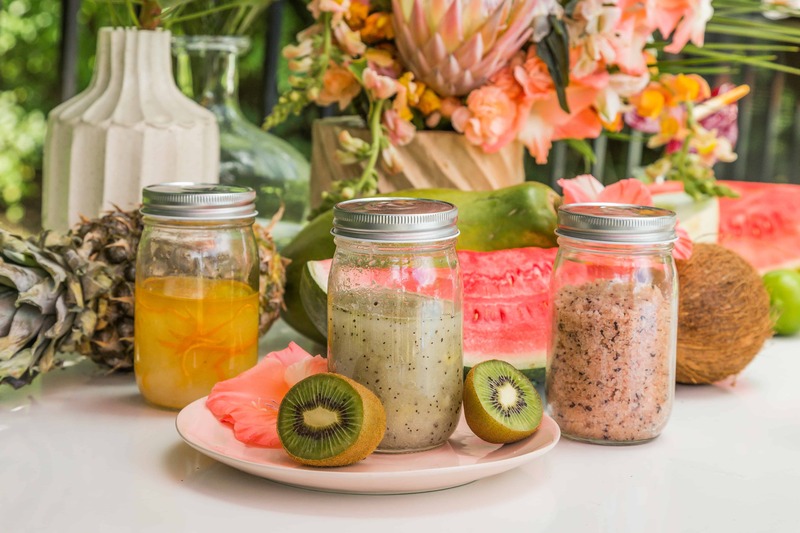 Consider this pretty pink scrub your magic elixir on early mornings or those days when you need an extra pick-me-up. The grapefruit will awaken your senses and get you moving while working to tone and cleanse your skin. Grapefruit boasts a ton of antioxidants to fight free radicals, not to mention that it’s high in vitamins C and flavonoids to detox and help protect skin. The real magic in this formula comes from the hibiscus, which is known as the “Botox” plant because of its ability to increase skin elasticity thanks to its high mucilage content, which helps plants store water and food. That means it will help your skin’s ability to retain moisture as well. With the anti-inflammatory and moisturizing effects of the jojoba oil, you can expect this scrub to leave your skin hydrated, smooth and supple. You’ll be left with a tropical glow and skin that is baby smooth. Add 1 cup pink Himalayan salt with 1/4 cup jojoba oil and 10 drops grapefruit essential oil to bowl. Open two hibiscus tea bags and empty contents into bowl. Mix with spoon until all ingredients are combined. Add more oil, if needed, to get get desired consistency. Apply to skin, scrub and rinse, or allow to sit on the skin for several minutes prior to rinsing for added benefit. 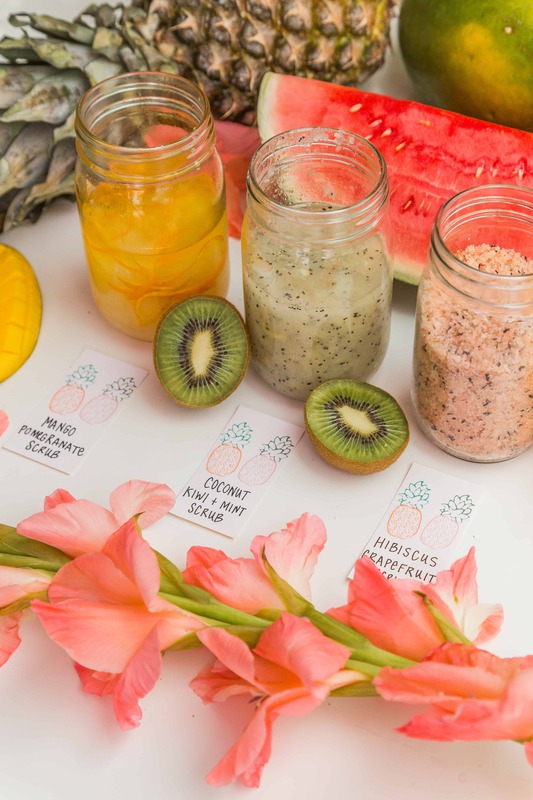 This whipped mango scrub is a hybrid between body butter and a sugar scrub. It’s light, airy and incredibly moisturizing. Because sugar granules are finer than that of salt, this scrub is a more gentle option for sensitive skin. And did we mention is smells like an orange creamsicle? Mango butter is a dream moisturizer for lots of skin types. Those with oily complexions will benefit from the astringent quality of the mango, which dissolves excess oil and helps heal acne scars. If you’re dealing with acne or a rosacea flair-up, both mangoes and pomegranates are great for soothing inflammation. The alpha-hydroxy acids in mangoes also provide chemical exfoliation that helps rejuvenate dull and dry skin. Use a double boiler to melt the mango butter. Once it’s melted, cool until almost solid and whip with a mixer until it’s smooth and fluffy (a hand blender would also work well here). Add the pomegranate oil and coconut oil and slowly mix into the butter. You can add some essential oils at this point if you like. We added 25 drops of sweet orange essential oil. To enhance the orange effect, we finely chopped the peel of 1 orange and added it to the mix, though you could zest it if you prefer. Finally, mix in the sugar. Apply to skin and exfoliate as you normally would and rinse. To take full advantage of the moisturizing properties, leave on the skin a little longer before rinsing off. This is common problem,so friends today we will be learn how to active domain directory directory domain service so here the first simple method to find solved this issue,now using this tips. How do you store these? Is there a shelf life?